A selection of previous gigs…. Thursday 31st January 2019 Whitley Bay Library. 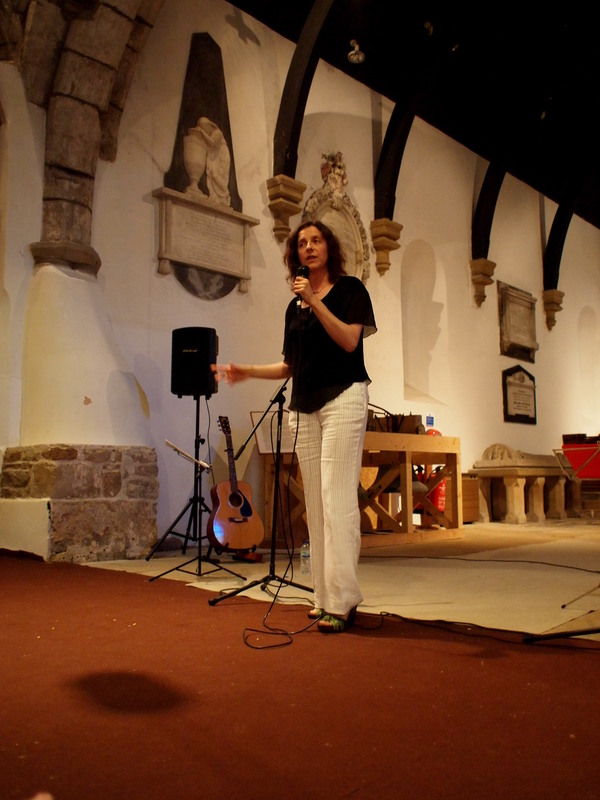 The event was called Meet the Poet: Elaine Cusack. It was my first solo show and it went down well. Thanks to North Tyneside libraries for promoting the gig and supporting me. I performed to an attentive, enthusiastic audience. Loved the night, including the after show party in next door’s Black Storm Brewery! Thursday 19th April 2018 Whitley Bay Library: Blackburn, Cusack and Creen. Performed with Ken Creen and Penny Blackburn. Hot night. Hot ticket! Ken’s break time quiz went down a storm.Thanks to North Tyneside Libraries for supporting us. And the lovely audience too! Thursday 21st September 2017 The Old George Inn, Newcastle. Performed at the second Pot Luck Club alongside my cousin Ross Punton, two thirds of The Cornshacks, Penny Blackburn and more. I performed one poem, Good Girl. Thursday 4th May 2017. Poetry Jam at The Waddington Street Centre, Durham, with poets Paul Summers and Tom Conway plus open floor spots. A refreshing change to be sans microphone. They can get in the way, you know. I thoroughly enjoyed the night. Monday 7th November 2016 supporting John Hegley at Whitley Bay Library with fellow poets Harry Gallagher and Ken Creen. What a blast for Harry, Ken and I to perform in front of an almost sold-out home crowd. And supporting John Hegley!!! June 3rd 2016. Bay Traders, Whitley Bay. MCed at a private party I performed a couple of poems in between introducing The Cornshacks, Harry Gallagher and Ken (with two “n” s) Creen. Friday 15th April 2016. Bay Traders, Whitley Bay. Private party. Performed alongside Harry Gallagher and The Legendary Ken Creen. Great fun. Tuesday 8th March 2016: International Women’s Day event, Wallsend. Performed one poem, Swifts Screech and Circle in the Afternoon Sun. The poem’s theme of creative recovery seemed apt.Great audience: attentive, supportive and receptive. Friday 20th November 2015. Bay Traders, Whitley Bay. Private party and as much fun as the last one in September. Great to see The Corn Shacks perform. I read poems including Skin Stains, Excavating Elaine & a Geordie haiku. Friday 11th September 2015. Killingworth Library. Part of the Heritage Open weekend. I was one several poets performing work about George Stephenson. The Sawdust Jacks performed too. Friday 4th September, 2015. Bay Traders, 305 Whitley Road, Whitley Bay. Don, who runs Bay Traders, asked me to perform at this open evening. I was happy to oblige. The invite only audience was lovely and I got to support a wonderful bunch of musicians including Mick, Gill & Stew “Bottle Man” Rickard. Friday 3rd April 2015. The Cumberland Arms, Byker, Ouseburnshire. Supporting Kevin Gilday from Scotland with his “The Man Who Drank Beer” show. Other support acts were musician George Sharpe and poet Vinny McHugh. Small but perfectly formed crowd. Warm reception but freezing cold room! George, Kevin and myself all fluffed/forgot our lines. I blame the microphone! Vinny was okay but he had his notebook with him to keep him right. Sunday 22nd March 2015. The Jam Jar Cinema, Whitley Bay. Free as a Bard featuring me plus poet George Jowett and musical duo, The Primates. Fantastic night. Primates evoked late period Velvets. George performed his stunning Bonus Canto. The audience were receptive. Sold out event.